More than 250 volunteers with the Civil Defence have worked tirelessly over the past fortnight to save homes and residents right around the country from flooding as a result of Storm Desmond. A summary report from the Civil Defence shows it activated 21 separate units to battle flood waters since Friday December 4. A spokesperson for the group said the flooding was the worst it had encountered in six years. 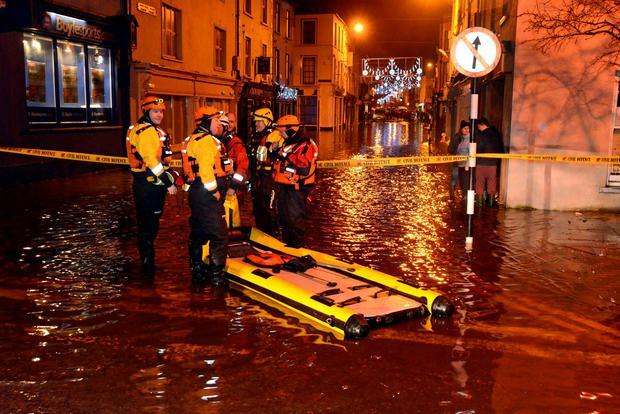 John Fitzgerald said teams of volunteers had been scrambled all along the length of the River Shannon in one of the biggest operations undertaken by the Civil Defence in years. "Since December 4, our teams have been sandbagging, manning pumps and ferrying stranded homeowners through flood waters. "At the peak, we had 250 ­volunteers out. This is the ­biggest operation by far since 2009-2010," he said. As the flood threat moved south along the Shannon, more and more teams were deployed. Volunteers based in Dublin also made themselves available to travel to the worst-affected areas over the weekend. Figures from the Civil Defence show that an average of 13 people were deployed in each affected area at any given time. At its peak, units in 21 separate local authority areas were activated. The Civil Defence has 4,500 volunteers around the country. The organisation has a wide range of equipment to deal with flooding, including 88 boats, 47 fire tenders, nine floating pontoon units, and 130 four-wheel drive vehicles. Throughout the past two-and-a-half weeks, volunteers have been busy evacuating people from flooded homes, pumping water, filling and deploying sandbags, transporting supplies to isolated families, and moving animals from flooded lands. Volunteers assisted with the transportation of home help to the elderly, and patients from nursing homes. Members of the organisation also assisted in the rescue of a number of people from cars trapped in the flood waters. Mr Fitzgerald said the Civil Defence flood response will continue as long as required. Paul Melia The first warning came on the morning of Friday the 4th, when Met Éireann told people living on the west coast to batten down the hatches and avoid unnecessary travel. Emily Beament Ali will be the first storm to blow in across Ireland and Britain this winter, the new list of names for this year's strongest weather systems shows. Darragh McDonagh Three cheeky monkeys staged a daring escape at Dublin Zoo after Storm Ophelia blew the roof off a section of their enclosure last October, newly released records have revealed.